Of all the holiday offerings at Disney World, Candlelight Processional is one of our favorites. It is a fantastic celebration of the Christmas holiday and never fails to be a moving experience. It is extremely popular and getting a seat can at times be difficult. That’s why we’re thrilled to offer this live webcast of tonight’s Candlelight Processional featuring celebrity narrator Neil Patrick Harris. The webcast will begin at 8:10 pm eastern. Come back to this page to watch below. Enjoy, and Merry Christmas from DisneyLists.com. Epcot has many great offerings for the Holiday Season, and the Candlelight Processional is arguably the best. This event is held in the American Adventure Pavilion and debuted at Walt Disney World in 1993. If you are not familiar with this event or have never been before here are 5 things you need to know about the Candlelight Processional. The Candlelight Processional is a Holiday favorite at Walt Disney World. 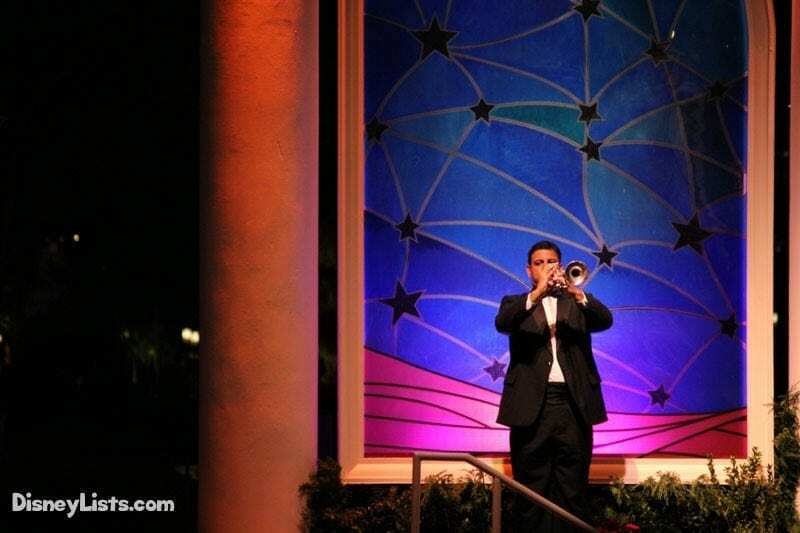 Each evening a celebrity narrator tells the Christmas Story and is accompanied by the Walt Disney World Orchestra and a mass choir. The mass choir is made up of high school choirs, wearing the gold robes and a special Cast Member choir who wears the green robes. 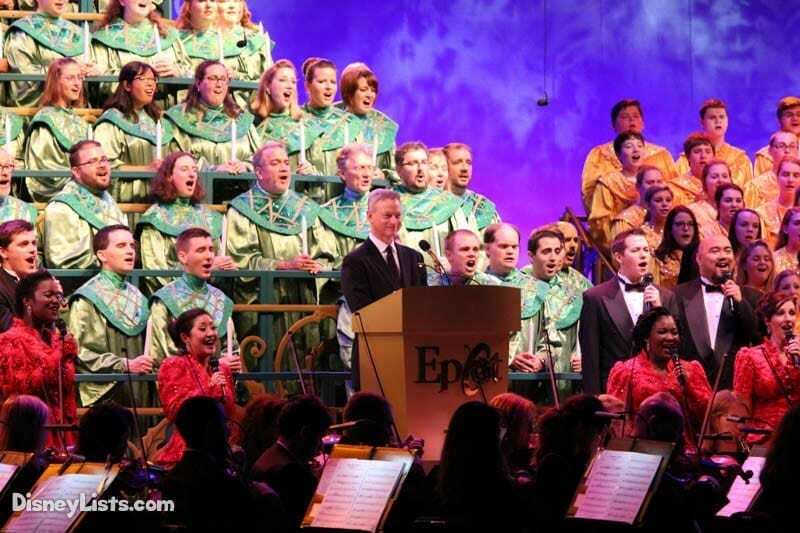 What is truly special about the Cast Member Choir is that they are not all Entertainment Cast Members. Cast from around Walt Disney World who work in any department can audition and volunteer their time to perform in this event! The choir sings traditional Christmas songs that are woven into the retelling of the Christmas nativity story. This event is offered at no additional charge. In 2018, The Candlelight Processional will be each evening from November 22th to December 30th. There are three show times each night; 5 pm, 6:45 pm and 8:15 pm. The performances are held in the American Gardens Theater at the American Adventure Pavilion. The Candlelight Processional is a very popular show during the Holiday season. All three performances each night will fill to capacity. If you want to view the show it is recommended that you get in the Standby line at least 1 hour prior to show time. Earlier during busy days such as weekends or days that have Extra Magic Hours at Epcot. If the celebrity narrator is extremely popular such as Neil Patrick Harris, you will want to get in line even earlier as well. A good strategy is to grab some snacks and relax while waiting for the next show. 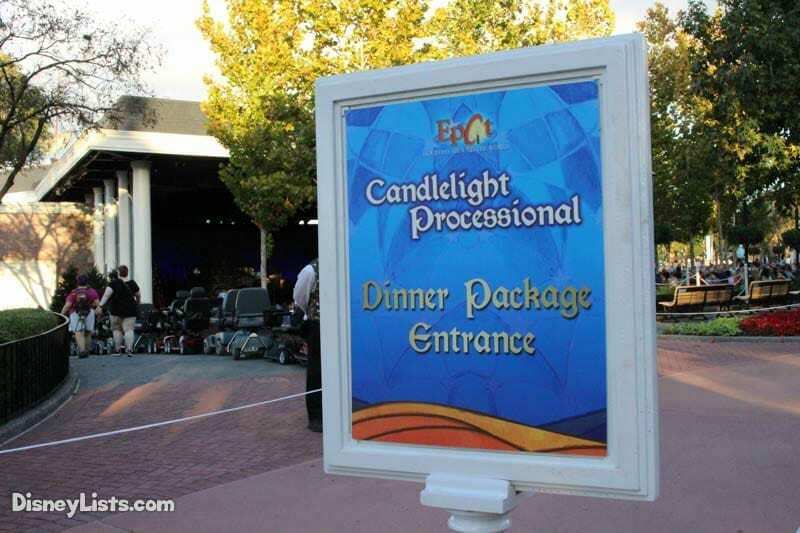 Another option instead of waiting in line ahead of time is to book a Candlelight Dining Package. These packages allow you to dine for lunch or dinner at one of Epcot’s many restaurants and then gives you reserved seating for a specific show time. This will eliminate your need to wait on the standby line for the show, but you still will need to arrive approximately 30 minutes prior to show time for seating. The reserved seating area for the dining package is located in the front of theater nearest the stage. Handicap seating is available in the reserved area as well. These seats will give you a great, unobstructed view of the entire performance. Most locations will offer preset menu and prices vary based on location and meal period. You can book the package online or by calling the dining reservation line. The Candlelight Dining package is strongly recommended if you are looking to see a specific celebrity narrator or show. 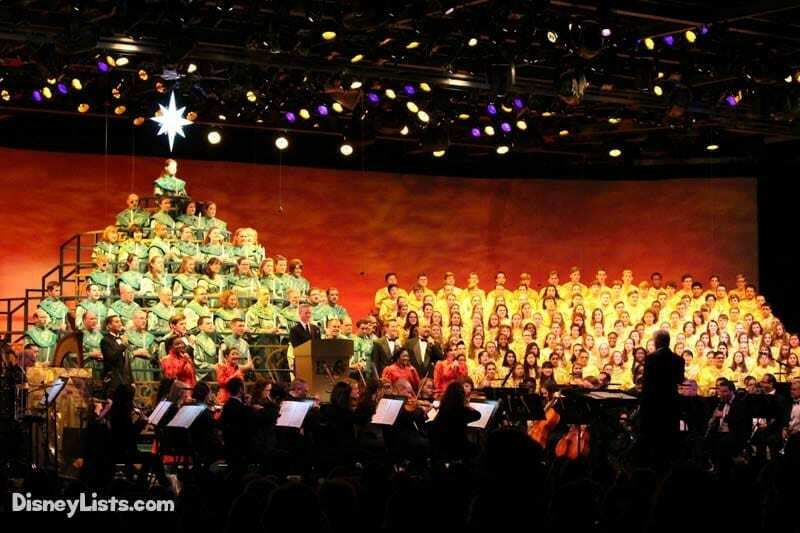 The Candlelight Processional at Epcot is a must do for the Holiday season! The beautiful music and the Christmas story is sure to fill your heart with joy! Be sure to get in line early or book a Candlelight Dining package for the best experience, as the theater will fill to capacity. Don’t forget to check out all the other great holiday offerings at Epcot’s Holidays Around the World during your visit!